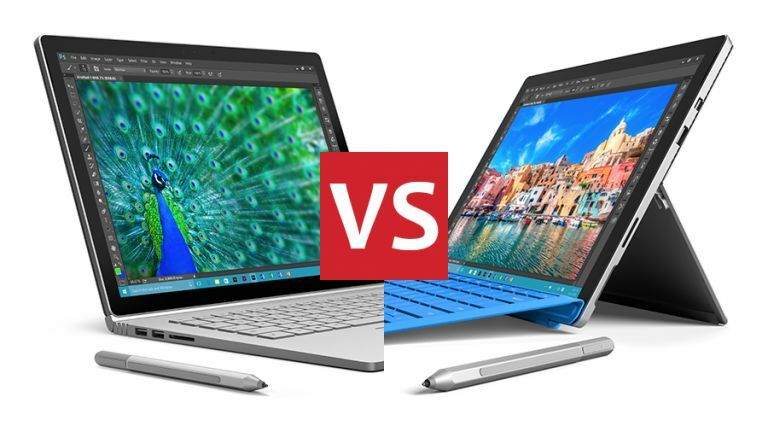 Surface Book vs Surface Pro 4: which Microsoft tablet is right for you? It's been quite a week for fans of Microsoft hardware, with Lumia phones, a new wearable and the HoloLens all shown off at a special event in New York. The company also had a surprise in store at the end with the new Surface Book laptop - so where does that leave the Surface Pro 4? The Surface Book and the Surface Pro 4 are essentially the same device approached from two different angles: the Book is a laptop that can do a job as a tablet, whereas the Pro 4 is a tablet that you can fashion into a laptop replacement if you prefer (as long as you're prepared to pay extra for the keyboard cover). With that in mind, the Surface Book is bulkier, since it has more heavy duty components inside. As a laptop, it measures 312.3mm x 232.1mm x 22.8 mm; as a tablet, the detached screen measures 312.3mm x 220.2mm x 7.7mm. The device weighs 1515-1579g as a laptop (depending on the configuration you opt for) and 726g as a tablet, and comes with a 13.5-inch screen. Over to the Surface Pro 4. It measures 292.1mm x 201.42mm x 8.4 mm and weighs 766-786g. With its 12.3-inch screen, that means it's slightly smaller than the Surface Book in tablet mode, but also thicker and heavier – no doubt because all of the components are packed behind the screen, unlike the other device. Thanks to the Dynamic Fulcrum hinge, the Book can flip over and re-attach to the keyboard. This gives you a touchscreen tablet that's chunky but very powerful and makes the Pro 4's trick of attaching a smart keyboard cover seem quite old-fashioned by comparison. If you want the best power and performance, the Surface Book has you covered: because it has a genuine laptop-style base, it can fit in a 6th Generation Intel Core i5 or i7 CPU, 8GB or 16GB of RAM, and an Nvidia GeForce GPU with 1GB of memory, which offers a big boost in its graphics capability. You can also pick from 128GB-1TB of on-board storage. The Book has more pixels than the Pro 4 (3000 x 2000 compared to 2736 x 1824), but because the laptop has a bigger screen the 267ppi is the same across the board. You also get 8MP and 5MP cameras front and back and Microsoft is promising a 12-hour battery life for video playback. The Surface Pro 4 also has a variety of configurations you can choose from: anything up to a 6th Generation Intel Core i7 with an Intel Iris graphics 540 chip, 16GB of RAM and up to 1TB of storage space. The 8MP and 5MP cameras are the same, though Microsoft is only quoting 9 hours of video playback on the Surface Pro 4. That means you can spec out a Surface Pro 4 to be almost as good as the Surface Book – the only big differences are the discrete graphics and the larger battery that the latter has the room for. If you're on a tight budget, you can get a less powerful configuration on the Surface Pro 4, something the Surface Book doesn't really dabble in. This is an easy one: both devices run the full version of Windows 10 Pro, so you can install all your favourite desktop programs as well as the universal apps that Microsoft is so fond of. In fact, devices like the Surface Book and the Surface Pro 4 are justification of the path Microsoft has taken with Windows 10 – the company's early attempts to make an OS that could run on laptops, desktops and tablets didn't look so clever back in the days of Windows 8, but it makes a lot more sense now. Both devices will run apps like iTunes and Photoshop fine, though the Surface Book is the faster machine and the Surface Pro 4 will struggle with the most demanding tasks like gaming or video editing (particularly at the lower end of the spec spectrum). As far as the on-board software goes, it's a dead heat, with nothing to choose between them, but how fast that software will perform is another matter. Both devices support the Surface Pen (which comes in the box) but remember to factor in the cost of the Type Cover as well if you want to use the Surface Pro 4 as a laptop (it's $129.99 in the US with international pricing yet to be announced). If you're going to be doing a serious amount of typing then the Surface Book is likely to be a much more pleasant experience – as long you can afford it. That brings us on to price: at $1,499-$2,699 (international pricing to be confirmed), the Surface Book is a serious investment. The price range for the Surface Pro 4 is $899-$1,599, so it's much more affordable (in the UK, pricing for the Pro 4 has been set at £749-£1,799). You're saving on the cost of the keyboard, the cost of the materials, and the cost of that extra graphics power, even if most of the internal specs can be made to match up. If you need a laptop with the power and typing experience that goes with it, then the Surface Book is going to be most tempting. If you plan to spend most of your time using your new device in tablet mode and want something lighter to carry around with you, then you can save yourself some money by opting for the Surface Pro 4.